This recipe uses my Almond Pie Crust from Nourished. You can find it here However the pie in the picture is made with a new one that I’m currently working on. I’ll post it when I have it finalized and written up. The biggest problem with custard-based pies is the soggy bottom crust. Pre-baking the crust and partially cooking the filling before putting it in the shell is the secret to this rich, creamy pumpkin pie. Prepare pie crust, cover edges with a shield or foil, and bake until firm and just starting to brown. Reserve. Preheat oven to 400 degrees F. Place a baking sheet on lowest oven rack. Whisk eggs, half and half, and vanilla together in a medium bowl and set aside. Combine pumpkin puree, sugar substitutes, salt, and spices in a large, heavy saucepan. Set over medium heat, stirring occasionally, until it starts to simmer, which will take about 5 minutes. (Mixture will splutter and spit, so use a deep pan or a splatter shield.) Continue to stir and simmer for 10 minutes or until thickened. Remove pan from heat and whisk in egg mixture until smooth. Press out any lumps or strain if necessary. Pour filling into warm pre-baked pie shell (reheated for a few minutes if cool). Use pie crust shields or foil to protect edges from over-browning. Set pie on pre-heated baking sheet in 400 degree F oven. Bake for 10 minutes. Reduce heat to 300 degrees F and continue to bake until edges of filling are set but it is still wobbly in the center, about 20 to 35 minutes longer. An instant-read thermometer inserted near the center should register 175 degrees F.
Set pie on rack and let cool for 2 to 3 hours until room temperature. Refrigerate pie when cool. Garnish with sugar-free whipped cream. 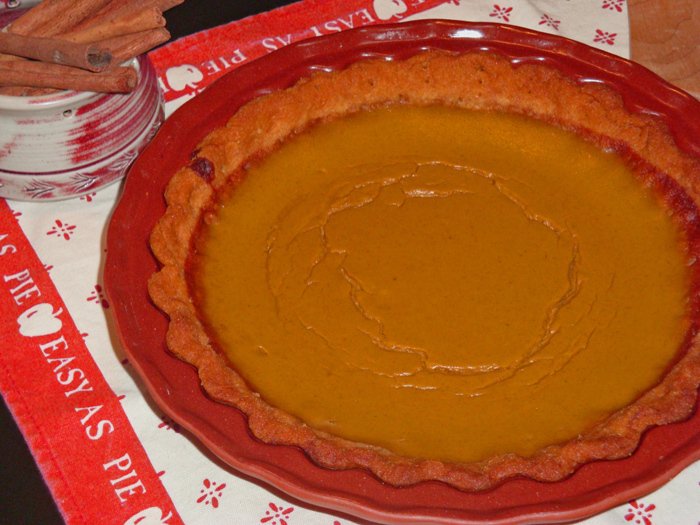 Cure for Soggy Crust, Holiday Pie, Pumpkin Pie. Bookmark. Sounds wonderful, Judy – most interesting method to keep your pie crust from getting soggy. Happy Thanksgiving to you and your family! I made this for Thanksgiving. Thanks for the great recipe. It has a creamy texture and great flavor! RedZinnia, Thanks for the feedback. Glad you enjoyed the pie!